From 1999 by British acoustic guitarist Martin Simpson, this is not an unauthorised bootleg, more an artist-approved boutique issue! My copy (with this cover) is on the imprint of High Bohemia Records of New Orleans. 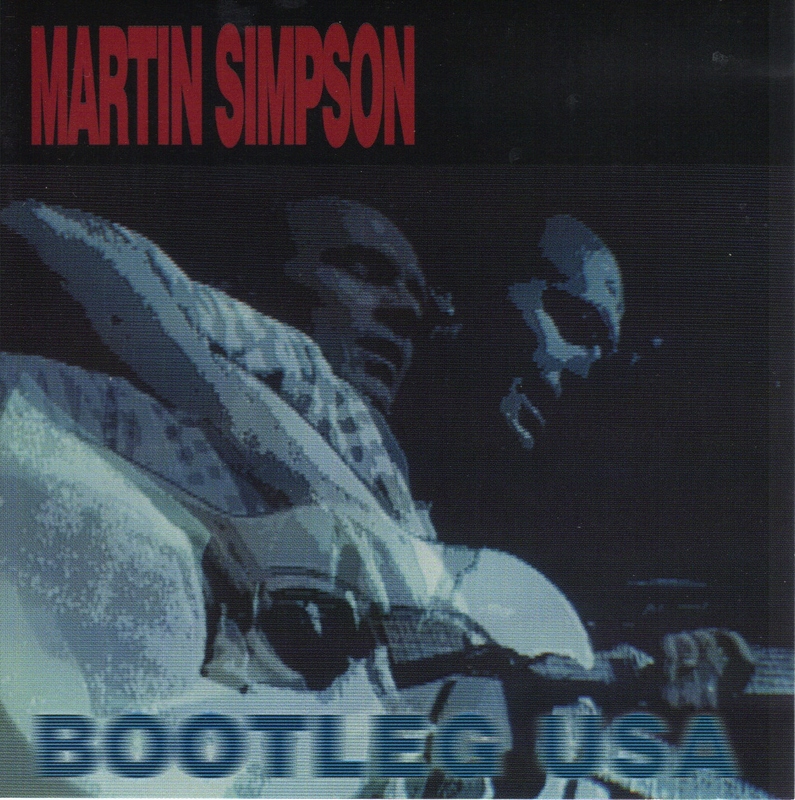 The same 10 tracks are available nowadays from Mr Simpson’s own website ( http://www.martinsimpson.com ), with a different cover and on his own Simpsonian label. It was the first Martin Simpson album I bought,secondhand from Pied Piper Records [now gone] in Northampton, and it showcases why he’s such a fine acoustic guitarist. It’s essentially just a bloke and guitar, recorded live at three concerts from 1998 and 1999 when he was based in the USA, plus one studio track (‘Fool Me Once’) with the additional accompaniment of Jessica Ruby Simpson on vocals and Doug Robinson (bass and vocals). I first came across Mr Simpson as an accompanist to the mighty June Tabor so it’s apt that the opening track is a song (‘Plains of Waterloo’) from her repertoire. The next is an inspired pairing of songs from John Tams (‘One More Day‘) and the Dylan number ‘Boots of Spanish Leather’. These are combined with real sensitivity. Track five is one of my favourite Richard Thompson songs, ‘Strange Affair’, from the composer’s most overtly Islamic period (also covered by Ms Tabor) and this is probably why I bought it. And track 8 mixes ‘Highway 61’ with Bob Dylan’s ‘Highway 61 Revisited’, again with a lightness of touch and instrumental ability. If you like hearing great guitar playing, Martin Simpson is a reliable exponent – but I guess the reason I keep playing this is because of his choice of songs. P.S. Listening to the rest of the album post-posting (if you see what I mean), I’d forgotten how good the track ‘Icarus‘, by Ann Lister is. And how well Martin Simpson interprets it.